These cupcakes were a hit with the ladies at work. I gave them two each to try. Two ladies chose the carrot cake as their favourite and one woman chose the red velvet. Which one will be your favourite? Let us know! Mix all of the ingredients in a food processor until all of the ingredients stick together and are fully combined. Spoon the cupcake batter into 24 cup cake tins or 48 mini cupcake tins. Put in the freezer to set and ice before serving. For the icing, separate half of all of the ingredients (except for the sugar) and place in a high-speed blender until smooth and creamy. Then mix the rest of the ingredients for the second round. 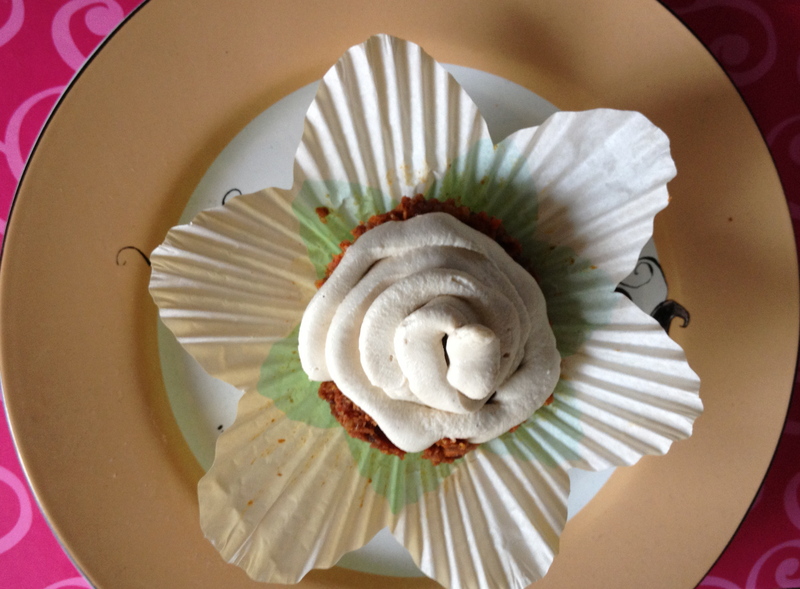 Place the cream cheese icing in a strainer lined with cheese clothe or lined with an almond milk bag. The strainer should sit over a deep bowl to catch all of the liquid that will fall from the mixture. Cover the icing mixture with the rest of the cheese clothe and place a plate and a weight over the clothe to squeeze out all of the remaining liquid. Culture the icing on the counter for 24 hours, and then spoon the mixture into a glass bowl and place in the fridge to set and harden. 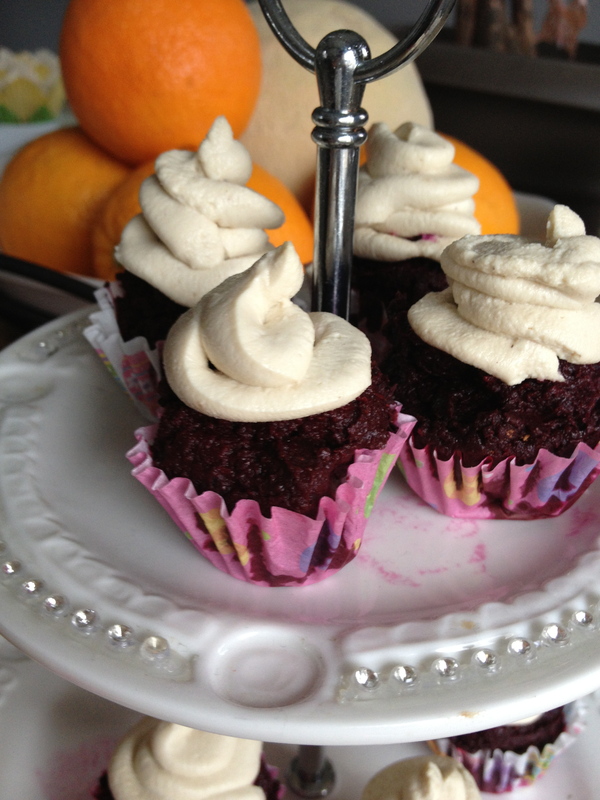 Mix the sugar into the icing with a spatula pipe onto your cupcakes for the added touch. 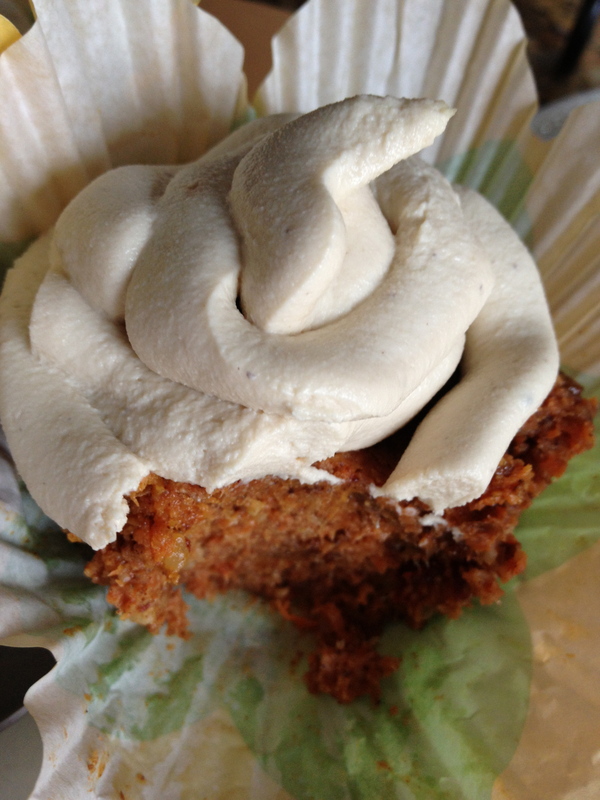 Mix some green juice or chlorella powder with the cream cheese icing to make the carrot cakes look like a real carrot! This entry was posted in Desserts, Recipes and tagged beets, carrot, cashew cream cheese, cinnamon, cocoa, cupcakes, dates, red velvet, walnuts. Bookmark the permalink.